this includes a 6-month auto insurance premium of $417.70 or $70 per month, but it seems every month has some gigantic bill like this, so I'm counting it. This does not include housing. I'm focusing on things I can quickly change. Now, the big event is I have decided to become more mustachian in my motoring. I really like my 2008 Nissan Rogue SL which I bought new under the notion that I deserve a brand-new car once in my life. However, it gets 25 MPG and is much bigger than I need for 99% of my driving. It's great for driving to ski resorts and trail heads, but I'm doing less and less of that these days. I've been biking a lot as well. This ski season I am going to try taking the year off and seeing if I miss it all that much, but even if I was skiing, that totals about 4 round trips to Copper Mountain per year. Not enough to justify taking dozens and dozens of Louisville<->Boulder round trips in a 25 MPG crossover SUV carrying a sole 138 lb person. So, I had my fantastic Craigslist setup where I have a nice Yahoo Pipe that gets RSS feeds from Boulder and Denver Craigslist ads, filters them to my interesting models and years, combines them, and turns the result into an RSS feed for me. It's a great way to casually monitor craigslist without a lot of ongoing hassle. The key to finding good deals I think is patience. Anyway, I was considering very much getting a newish Honda Fit (2007 or even the newer 2009 model) manual transmission, which would have run me between $8500 and $10500. However, I happened to find a somewhat rare 2001 Honda Insight hybrid 2-seater hatchback with 105200 miles on it and I ended up getting that. More details below. So now I've got a teeny tiny aluminum and plastic hybrid that will easily get at least 48 MPG. With some hypermiling driving techniques that number can be increased as well. This was also a good opportunity to switch to cheaper car insurance without collision coverage, so I went from State Farm to Geico and cut my bill to less than half its current amount. Now, about this Insight. It's tiny. It's 1900 pounds, seats 2, and has only a small hatchback storage area behind the seats. However, I ensured it will accommodate my baritone saxophone, bag of music gear, alto saxophone, and music stand with no problems, so that's really most of what I need. I hesitated and thought maybe I should get a 4-seater Honda Fit hatchback with fancy seats that fold flat 2 ways for versatile cargo options. However, at the end of the day I figured if I was going to change cars, I may as well go extreme. In hindsight seeing the transaction costs ($545 in taxes!) and huge hassle, I'm glad I went extreme. I'd rather not go through this again for a good long while. There is no more fuel-efficient car available than the Honda Insight in the USA ever. It is more efficient than any modern Prius or other hybrid, including the current 5-door Insight models. And if there is anyone whose lifestyle is actually compatible with the Insight, it's me - a single guy with no kids, no pets, and no commute. My driving consists of 2-5 trips between Louisville and Boulder each week and usually 1 or 2 trips to Denver each month. I'm working hard to limit my Louisville<->Boulder car trips to 2 or 1 per week by biking it most of the time. Given my social and fitness hobbies, I end up having at least four activities in Boulder each week. I'm getting more and more reluctant to go to Denver for anything these days as well. So I figure I'll try it out. Worst case, it will hold its resale value and I can resell it. Resale is a fairly big hassle, so I'd probably keep it at least one year. Insight drivers are especially dedicated and are fanatics, so they go quickly on craigslist and there are community forums like Insight Central where they (now we!) share knowledge with each other. The transaction costs and repairs were shockingly high as well, so I pretty much have to drive it several years to make it actually Mustachian overall. I spent this morning (10/20 - post was written in several sittings) getting the thing whipped into shape. As I sit here at Vic's Espresso, it is getting four new tires installed. It needs a handful of repair and maintenance items. I hope to get them all dealt with within a week. Reflecting on the actual craigslist transaction, it was one of my poorer experiences. I consider myself a pretty savvy craigslister for the most part, but this was my first private party auto sale acting as the buyer. The seller was less honest than I would have liked, and the cost of getting the car into true running shape is much higher than I was hoping. I only test drove it at night and didn't see several minor cosmetic issues such as the stereo casing being cracked, the driver side window molding being damaged (a $200+ repair), and a small chip in the windshield. Also the seller had let the registration expire so was hesitant to let me take it on a truly thorough test drive. If I go through this again, I'll have a better spidey sense about dishonest sellers and will probably walk away. But overall, I think I'm going to like having this car, and over years I hope to save a good deal of money on fuel as well as being able to take thousands of dollars that are just depreciating in my Rogue and investing them where they can appreciate. I can also recommend Accountable Auto Care in Broomfield for doing a thorough pre-purchase inspection for me. They charged $70 and I think some shops will charge $60, but they were closest to the seller's house. One good DIY success was the new stereo for my Insight. A stereo without an 1/8" stereo miniplug auxillary input is totally unacceptable to me, so I bought one for $54 from amazon.com using a portion of a $200 gift card I earned by doing a survey interview last month. I was tempted to have it installed at a shop, especially when I realized I would have to wire up the wiring harness for this stereo to the adapter for the car, which is an extremely tedious thing. I priced installation as well as new speakers, but ended up doing the whole thing myself. 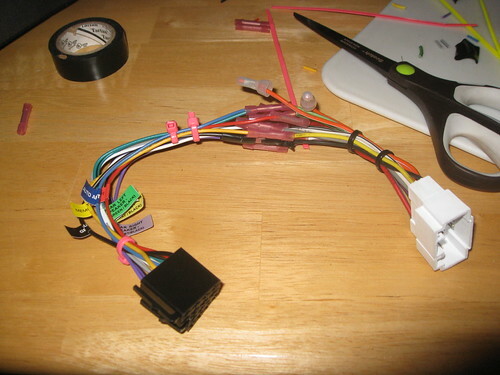 I re-used the existing wiring harness ($21 savings) and just cut the wires where they were crimped. I used regular household scissors instead of wire strippers, and the guy at the car audio store was nice enough to give me a handful of crimps I could use to make the connections. I was able to get the whole thing wired up and installed without too much trouble. Even though I thought I was being pretty frugal (at least in the long-term sense) this month, I'm still pretty shocked by how much money I spend. Here are some improvements I made, though. My upstairs tenant left and I have yet to find another one though! I'm satisfied with my restaurant spending this month. $23 for one restaurant meal plus pupusas for me and a friend, and another $5 at coffee shops. I don't think it's realistic for me to drop much lower than this anytime soon. I suspect going forward I'm going to drive no more than 500 miles per month. I also think the Insight can do this on a single tank of gas for about $31. We'll see how it plays out in the next few months. A word on those groceries. I know many Mustachians do much better than that for a single person, but I'm a bit baffled by it. That's almost all from Costco and I'm eating a crazy-monotonous diet and cooking at home all but 2-3 meals a month. This is one area where despite my intentions, the super-low grocery bills of the more skilled mustachians remain an elusive mystery to me. And forget about Jacob from "Early Retirement Extreme". I can't even imagine how he gets the numbers he claims, nor do I really want to. Now, not all of those Costco provisions were entirely consumed by October 31, but most of them were. My plan going forward is a big Costco/Super Target run once a month. They are both close by in town though, so it's not a big deal if I end up going twice a month I think. Fresh veggies and perishables are obtained via bike trips to King Soopers as needed. I'm not sure I'm either willing or able to get much lower than $300/month, but we'll see as my skills increase. That said, today I bought a 10-lb bag of raw dried pinto beans at Costco for $8.89, and we'll see if I can get that staple portion of my diet even more frugal than it currently is. Tracking everything I spent was pretty illuminating this month. I use mint.com pretty heavily, but their categorization just isn't accurate enough to really trust. They are great for total annual expenditure, but for digging into the details, I still think manualy tracking is necessary. Any mustachians read this post? Please share your thoughts below (or in the MMM forum).